Happy New Year!!!! Wishing all my friend a year full of love, happiness, prosperity and great health. As soon as I got up this morning, I hopped on over to Studio Calico to check out my Day to Day class. WOW, the printables, downloadable files and the PDF's are to die for. The design team ROCKS!!! I'm super excited to be a part of this wonderful class. The videos were great. I have been pretty active on the Studio Calico Project Life board lately. The girls there are so sweet and full of inspiration. 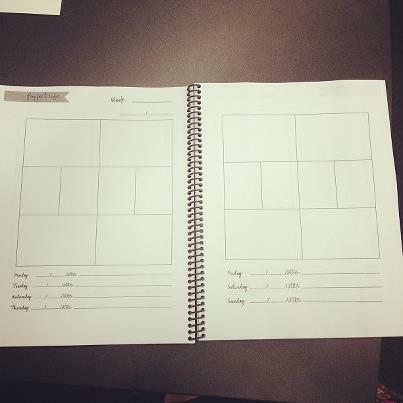 Last year I printed out the Marcy Penner's free downloadable files and used them to plan out my weeks. I added notes, quotes and important information that I wanted to include in my pages. Well, this year Stephanie created a title page and shared it with the girls on the SC board. 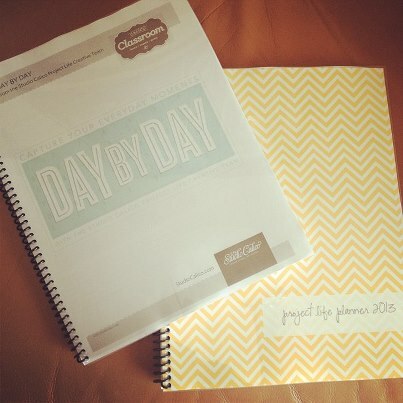 When I saw it, I knew right away I wanted to use it for my 2013 Project Life Planner. I copied all my files to a flash drive and headed over to Staples. The girl at the copy counter was super sweet. She printed out all my pages in color and bound all my books. I have also started working on my 2013 Project Life cover page. Here is what I have created so far. Once it's complete, I will share pictures. I LOVE KERRI BRADFORD!! Her files are amazing and she is truly a sweetheart. I used several of her files to complete this page including her new Weeklies. I may change it up a bit but this will be the base of my cover page. I will be adding a picture of hubby, myself, Kasi and Damian to each of the middle polaroids. Now off to take down our Christmas decorations. Oh before I leave you, I wanted to share a little something with you. One of my goals this year is to take EVERYTHING out of my scrapbook room and make is a room exclusively to Project Life even if it means to put everything in boxes and in storage. This morning, hubby helped me plan everything out. We will cover all the holes and repaint the entire room. I'm going to put my desk back to it's original look and up against the wall where I originally had it. I also want to have my new printer, my Cameo and my laptop all in it's own spot as well as my typewriter and sewing machine. Of course, I will share the process of it all right here on my blog. Hope you are all having a fabulous day!! So cool! I can't wait to see your progress! 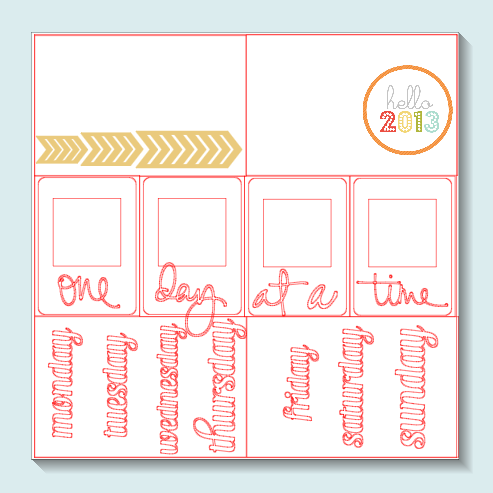 Love your title page, the "one day at a time" sentiment is very thought provoking and a wonderful theme to live by. That's an amazing goal for your craft room, lots of luck! Isn't it wonderful to have such a sweet husband? They are so helpful and supportive.